The Tell a Friend campaign invited visitors to spread the word about VIV Asia to their industry networks and friends. The Award was a dinner offered at a fine dining restaurant in Bangkok. Lucky codes were published on different means of communication in the past months and were used by our winners when registering as visitors to the show or offered by our show partners for their clients to register. 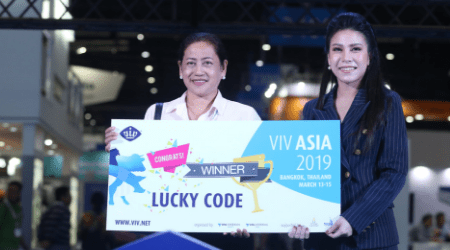 For the next VIV Asia, mind the lucky Codes! You could win an iPad. Complete your online registration now to visit VIV Asia 2019. Once registered, you will have the chance to invite 3 or more colleagues and/or industry friends to register and attend the show with you. Get the chance to WIN 1 dinner out of 10 offered by the organizers in a designated restaurant in Bangkok. VIV Asia is held in Bangkok, a top destination that allows all attendees to truly enjoy a whole week of business… and fun! Share your passion for VIV on all social media, and tell the world that you’ll be in Bangkok on 13-15 March. Once registered, share in 1 click your next destination on Facebook, Twitter, and Linkedin. Are you managing the visit to VIV Asia 2019 for a group of more than 8 people? Do so by using the “Register a group” option during the registration process. You will be appointed as the group leader and will be able to collect your colleagues or industry friends entry tickets at once. Thanks for your work! See you all in Bangkok! VIV Asia 2019 offered a wide range of special events in venues close to BITEC, and events covering specific topics on the show floor. Read more about these events. Bangkok is one of Asia’s great capital cities, a dynamic business and cultural center for both Thailand and the region. Read more about Bangkok and how to enjoy your stay in the city. Here you can find an overview of the top Asian feed to food suppliers. 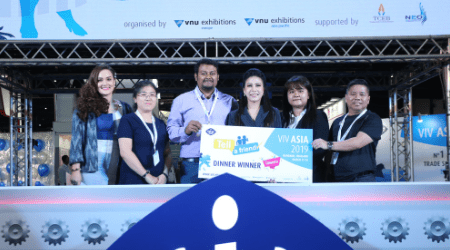 Find over 1,250 companies in the exhibitor list that showcased at VIV Asia 2019. In cooperation with VIV Worldwide, the Netherlands-African Business Council (NABC) has organised a special program for the African stakeholders and for visitors interested in the African livestock sector at VIV Asia 2019. The Hospitality Club offers a place to relax during VIV Asia, away from the exhibition buzz, but within the showground area. Find a quiet space where you can have drinks, snacks and WIFI and take your time during your visit to the show.